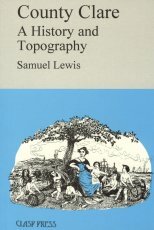 In 1837, Samuel Lewis issued his Topographical Dictionary of Ireland in two volumes running to over 1400 pages and aimed to present every fact of importance tending to illustrate the local history, or convey useful information respecting the past and present state, of Ireland (and) to give, in a condensed form, a fateful and impartial description of each place. Arranged in discrete alphabetical enteries - starting incidenatlly, with the parish of Abbey, in Clare - we find accounts of cities, towns and villages, particulars of dioceses, parishes and counties, and short references to coastal and other islands. All in all, it presents a wonderful Gazeteer of the whole of Ireland, providing much background information to the past and perhaps more importantly, permitting us to glimpse facets of life as it was prior to the Famine. The Clare enteries given here are taken as they appear in the original. In bringing together all of the Clare enteries in one short volume, we feel that a service has been rendered to readers in the county, making available in an accessible form material which might otherwise have been out of reach.